In the beautiful heart of the Shannon Region of Ireland lies 1 Pery Square Limerick a luxurious hotel and spa just waiting to pamper you. At the helm is the vivacious Patricia Roberts the owner who has put her heart and soul into her latest project, not to mention the 5 years in development and 5 million euros spent in transforming this once hostel into an intimate Georgian Boutique Townhouse Hotel and Spa. Originally planned for opening in September 2007 No 1 Pery Square actually opened 18 months later and is said to be the best example of Georgian architecture in Limerick. 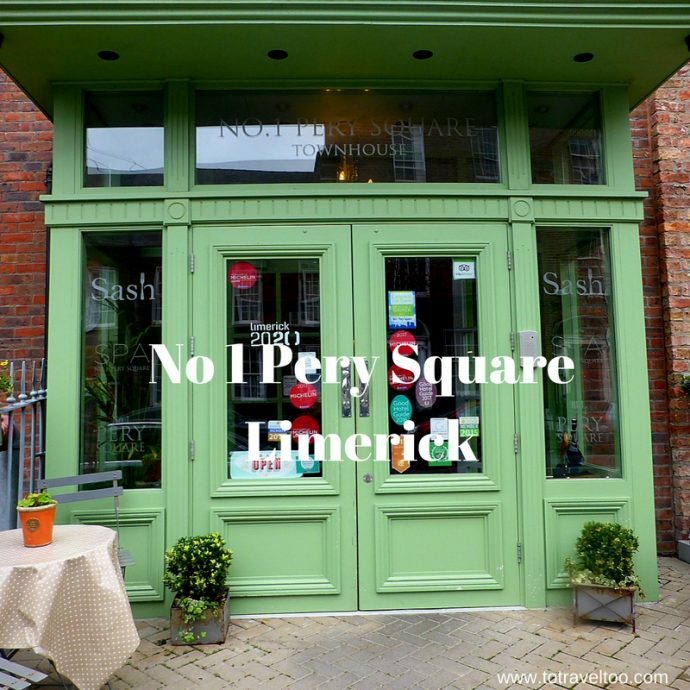 No 1 Pery Square is just what Limerick needed! Limerick has had a chequered past dating back to when the Vikings first landed in the 9th century. It is Ireland’s 3rd largest city and had the unfortunate nickname of ‘stab city’ but things are changing Limerick has put its past behind and is forging ahead. They have a plan – Limerick 2030 – where they want to attract 12,000 new jobs by that date and the latest news is that they are already two thirds there. Limerick was Ireland’s first-ever city of culture in 2014 and bids are in place to be the European Capital of Culture in 2020. We are excited for Limerick, it had a great vibe about it and a city that we would like to go back and explore more. One night is not enough to enjoy all that Limerick and No 1 Pery Square have to offer. 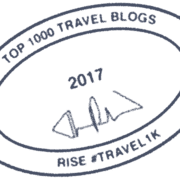 No 1 Pery Square is one of the top hotels in Limerick Ireland and is represented by the prestigious Ireland’s Blue Book of properties. The Pery Square Tontine Company built the Georgian residence around the 1830s. A Grade I listed building inside and outside it is one of 6 Georgian houses that were built during that time in the historic Georgian quarter of Limerick. One Pery Square has been renovated to include 20 bedrooms (15 Club Rooms, 4 Period Rooms, 1 Suite). The Club Rooms overlook either the garden or the red brick Georgian terraces and each is named after an Irish Poet. The 4 Period rooms are in the main townhouse and are named after a previous resident of No 1 Pery Square. The Vanderkiste and Lord Barrington Rooms have park views, roll top baths and dressing screens whilst the Lady Barrington and Pery Rooms have views over the kitchen garden and terrace and have handcrafted brass and gilt beds. All 4 Period Rooms are accessed by the original staircase that sweeps up through the house. On arrival at No 1 Pery Square, we were greeted warmly by Patricia who we found out later was Patricia Roberts the owner. If you arrive by car there is car parking located close to the hotel. Patricia recommended that after we settled into our room we may want to have tea and scones in the Park Room before we headed out to explore all that Limerick has to offer. Who could refuse tea and scones? The scones with fresh cream and jam were to die for! 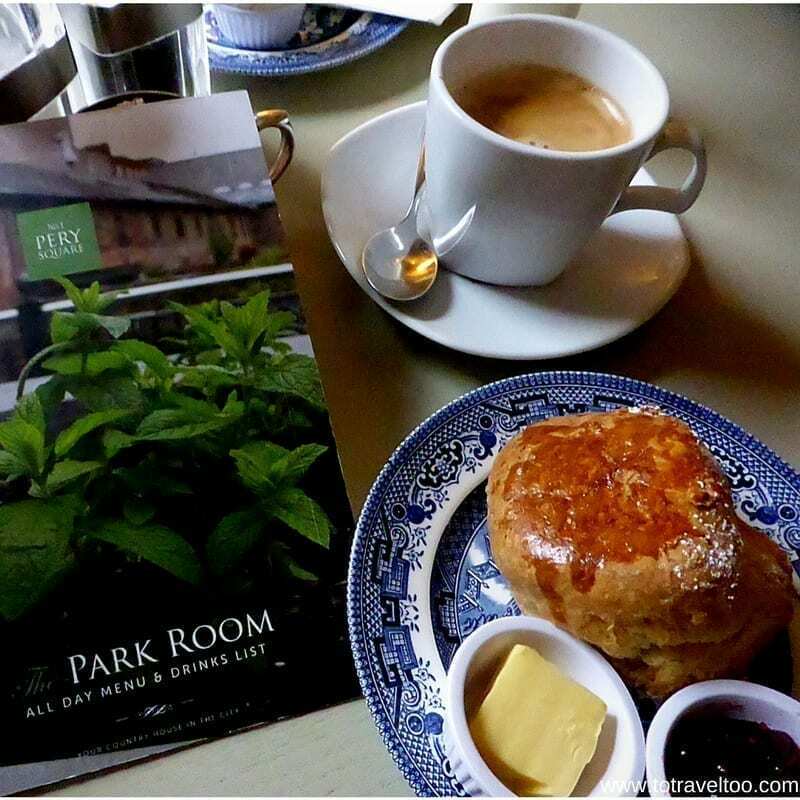 We would recommend 1 Pery Square for afternoon tea Limerick. We were staying in the Russell Room, one of the Club rooms that was named after an Irish poet. Check out our video of our first view of our room for our one night stay. Our first view of the Russel Room that was room for the night. Click to view. Our room was spacious, with luxurious touches and stunning views over the leafy People’s Park and the Church. Bathroom toiletries were provided by Voya from the hotel’s Spa. VOYA is an Irish Organic seaweed skincare brand. We slept very well, the bed is one of the most comfortable we have ever slept in. We mentioned this to Patricia the next morning and it was interesting to hear her story about the beds. She wanted to purchase these particular beds and tried to source them overseas but she ended up finding that they were locally made in Limerick. We knew we were in good hands when we heard that the head Chef Tim Harris came from Australia. Sash Restaurant on the first floor is named after the sash windows which is a distinguishing feature of Georgian architecture. Tim uses locally sourced and seasonal produce in his menu and herbs grown in the kitchen’s garden. 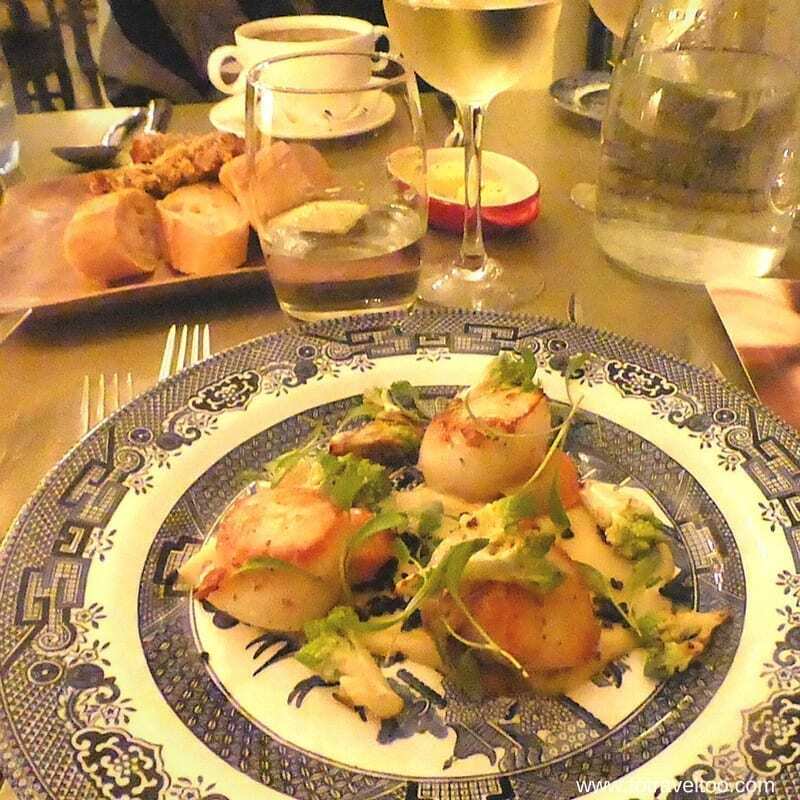 With so much to choose from the autumnal menu, what did we have? 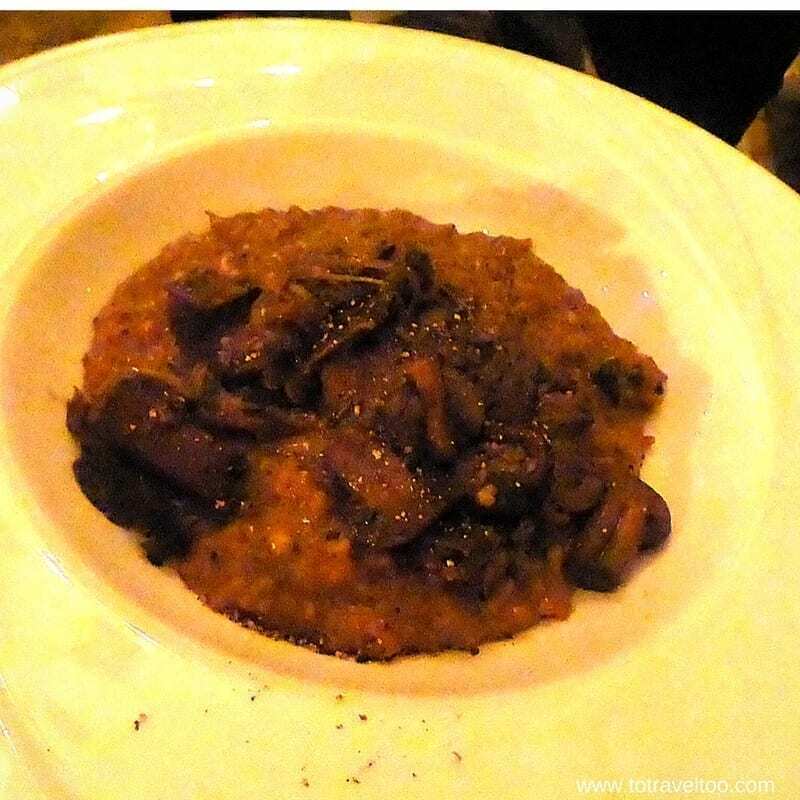 Duncan enjoyed a starter of scallops, a main dish of rib-eye beef and the scrumptious chocolate espresso cake whilst Jane enjoyed the vegetable soup and mushroom risotto. The wine was an excellent Sancerre from France. We must mention Emma who made the amazing dessert, which Duncan is still raving about. The Sash Restaurant is not only popular with guests staying in the hotel but is popular with locals and a great venue for small weddings and parties. Breakfast was also in the Sash Restaurant the next morning with the warmth of the sun coming in through the sash windows, it was a lovely spot to linger and enjoy the hospitality of the staff and the excellent buffet on offer. After a breakfast of muesli, yogurt, eggs benedict and a full Irish breakfast we were ready to set off and explore Limerick before heading to our next destination. Unfortunately, we did not have time to visit the Spa, but when we return to Limerick it will be high on our list of things to do. In 2017 The Spa at No 1 Pery Square Limerick won The Best Facial at the Irish Tatler Spa Awards in association with Decleor held in Dublin on 6th July 2017. Patricia has created a unique Spa retreat in the basement of the Georgian townhouse retaining the exposed brickwork and original stonework. The Voya products are used in a range of treatments for men and women which include a thermal experience, herbal cocoon, coal bunker sauna, aroma steam room, Irish mist showers and a zen garden. The Day Spa is popular with locals as well as guests who come just for the spa experience. If you are considering a stay or a day visit at No 1 Pery Square check out their specials. Whilst you are at No 1 Pery Square pop into their wine shop which is housed in the main hotel near reception. The Wine Shop stocks great wines, champagnes, ports as well as unique food items such as chutneys, pestos, dressings, puddings. The shop also stocks handmade cards and decorations, jewelry, food books, interior gifts and spa and beauty products. 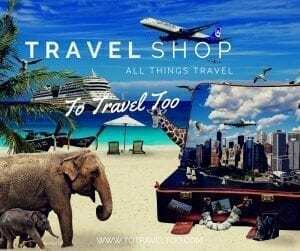 The Shop is open daily from 10.00 to 18.00 hours. 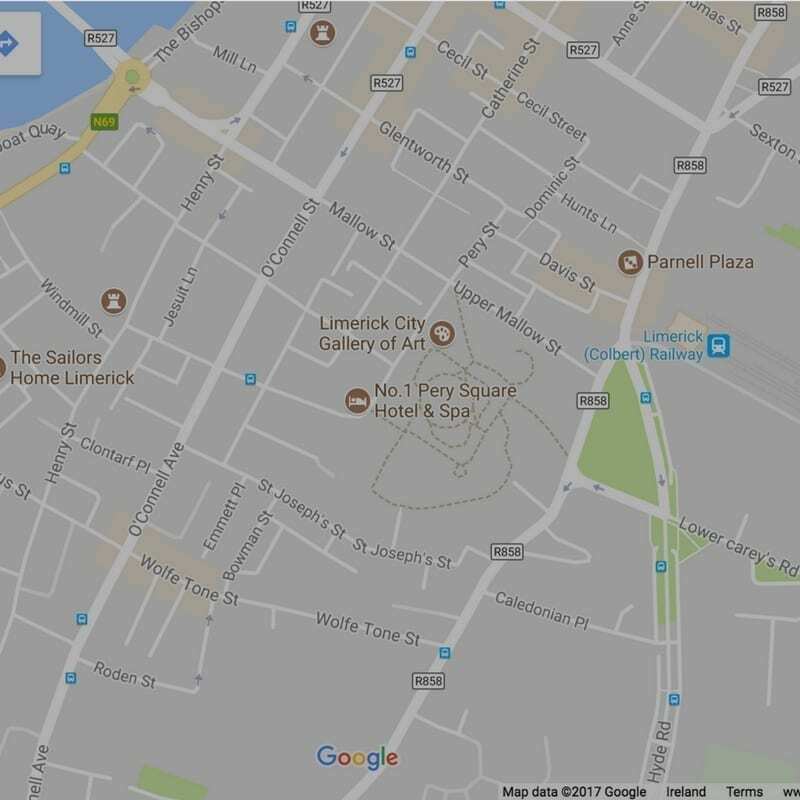 No 1 Pery Square is only a 5-minute walk from the City Centre and the train and bus stations of Limerick. Have you read Frank McCourt’s famous memoirs – Angela’s Ashes – about his life growing up in Limerick? The lanes mentioned in his book are just a few minutes walk from the hotel. The Frank McCourt Museum is only a short walk from the hotel in Hartstonge Street, and the pub that Frank McCourt had his first pint in – W. J. Souths is just a 2 minutes walk down the road and should be high on your list of things to do and see. Address for W. J. 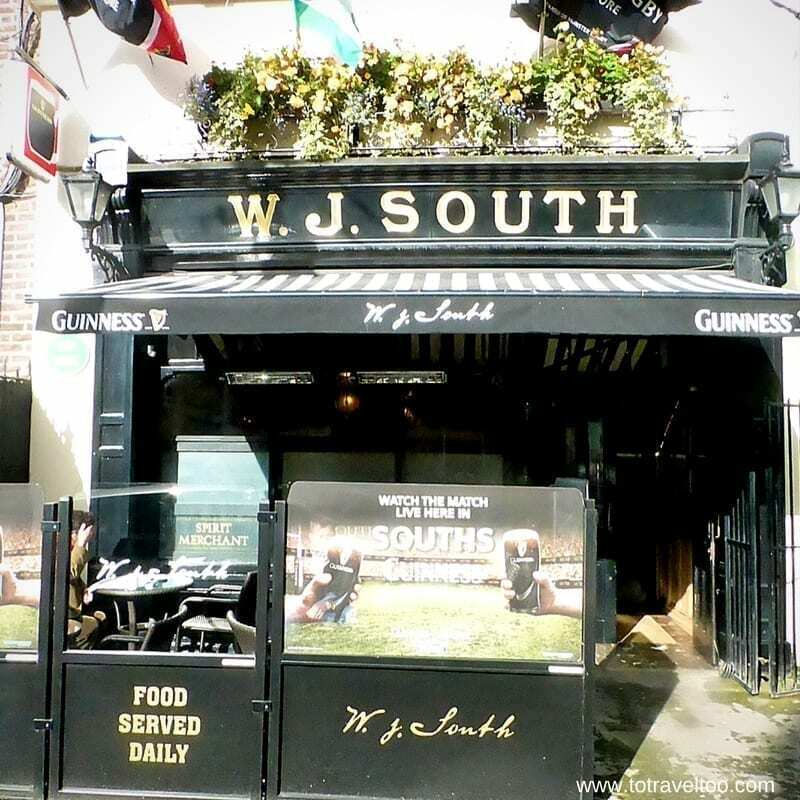 South Pub – 4 Quinlan Street, Limerick trading since 1909. 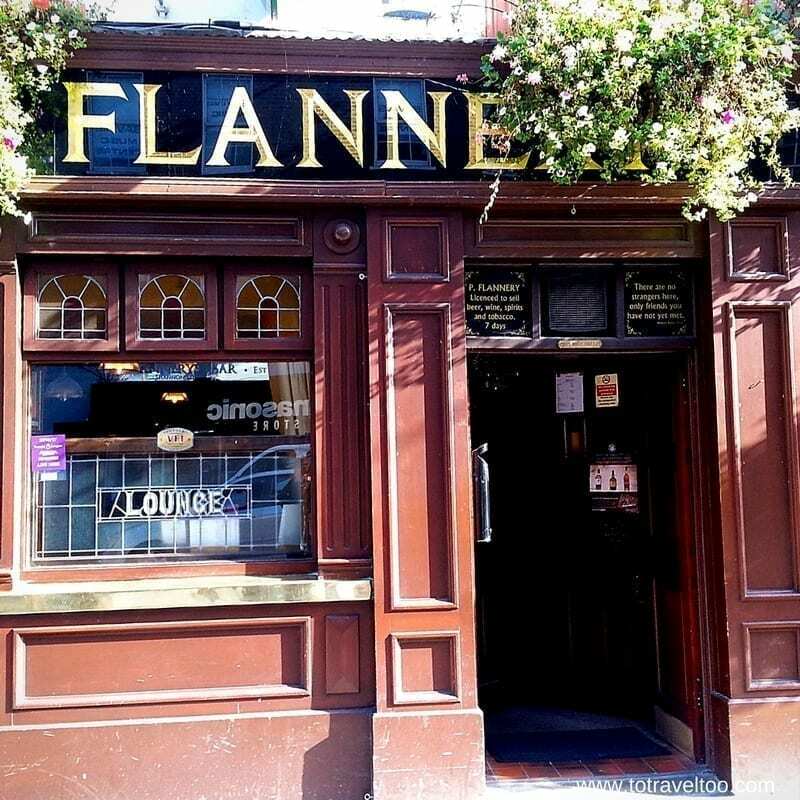 Another recommended pub which apparently is Limericks best-kept secret (not now since we are mentioning it) is Flannery’s Pub located at 19 Shannon St Limerick. 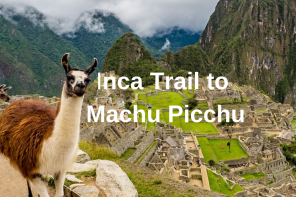 We also learned that Che Guevara, an Argentine Marxist revolutionary, physician, author, guerrilla leader, diplomat and military theorist visited Limerick once in 1965 when his flight was forced to land at Shannon Airport, just 20 minutes away. October 9th, 2017 marks the anniversary of the death of the Argentina-born figure who helped Fidel Castro topple the Batista regime in Cuba in 1959. To honor the occasion, the Irish government has released a 1 euro stamp featuring the image of the revolutionary. Hunt Museum – a personal collection of antiques and artifacts donated by the Hunt Family who were antique dealers and advisers housed in the Georgian Custom House in Rutland Street on the banks of the River Shannon. There are works by Pablo Picasso, Jack B. Yeats and Sybil Connolly on display as well as pieces from the Stone Age of Ireland and Ancient Egypt. 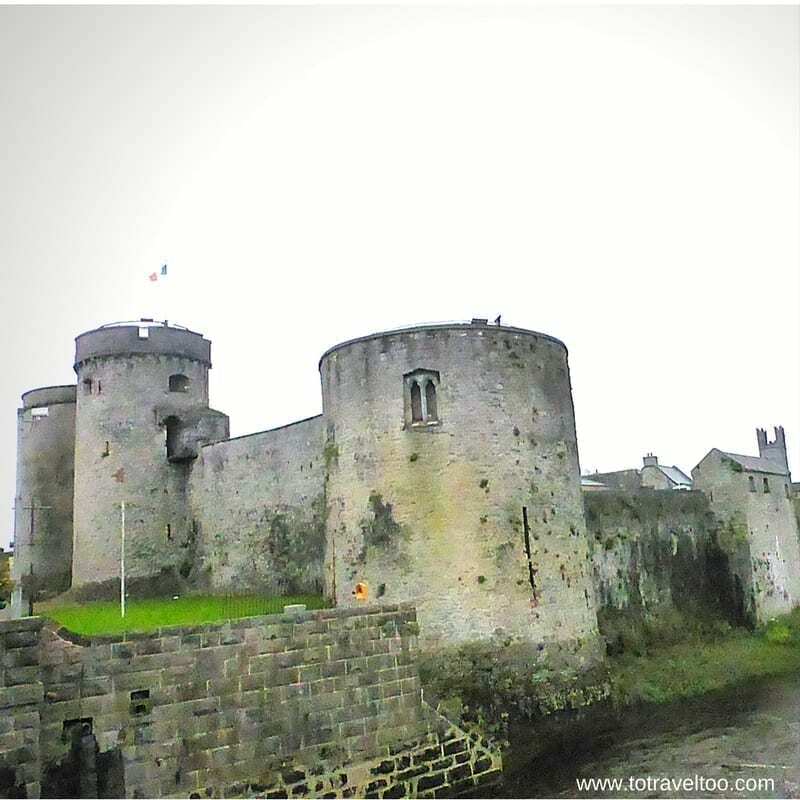 King John’s Castle – a 13th Century castle located on the River Shannon with great views from the top of the tower. 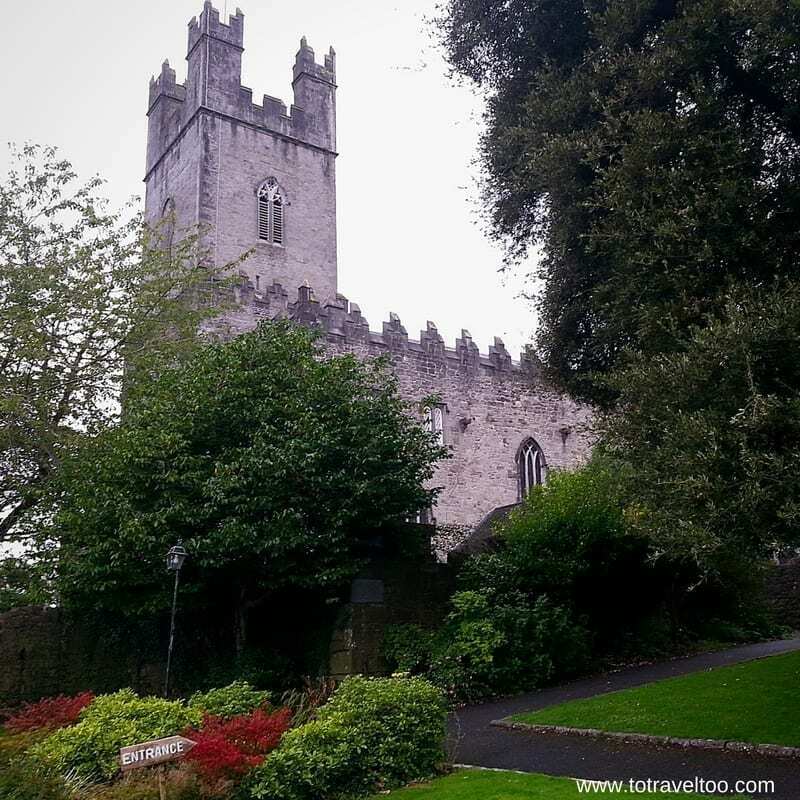 St. Mary’s Cathedral – a 12th-century church with an interesting small burial ground. Treaty Stone – which was used in the signing of the 1691 Treaty of Limerick and is located on the opposite bank of the River Shannon to King John’s Castle. Lough Gur – One of Ireland’s most important archaeological sites which includes a shallow lake and 2 castles – Bourchies’s Castle and Black Castle. Ireland’s largest standing stone circle – the Grange is also located here. 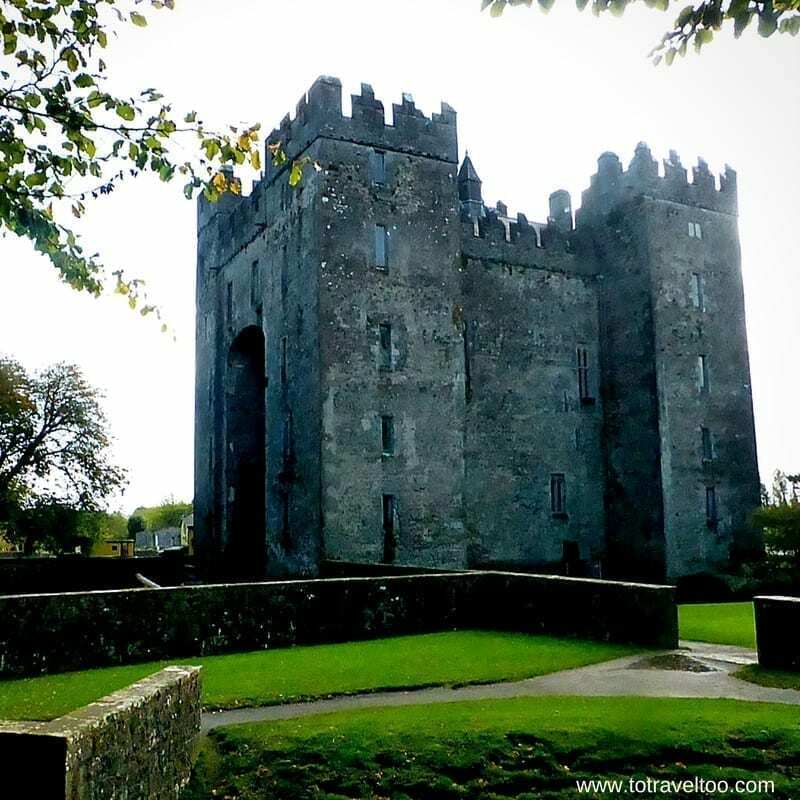 Bunratty Castle – Built in 1425 and is located in the middle of Bunratty Village. As well as the Castle to visit the folk park is well worth time spent in as well. It is only a 25-minute drive from Limerick, we spent 2.5 hours there but you can spend longer. There are coffee shops to enjoy as well. We thank Patricia and her team for looking after us so well for our one night at 1 Pery Square Limerick. If you enjoyed our post on No. 1 Pery Square you may be interested in another of Ireland’s Blue Book properties – Barberstown Castle in Straffan County Kildare, Carrig Country House Killorglin and The Mustard Seed in Ballingarry. 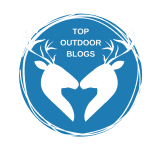 If you enjoyed this post, why not pin it for later. 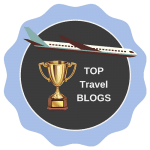 DISCLOSURE: We enjoyed accommodation, dinner and breakfast as guests of No 1 Pery Square Limerick and Ireland’s Blue Book but received no further remuneration to write this post. 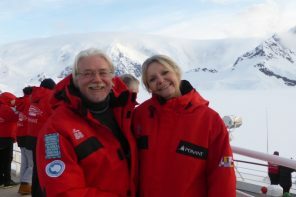 We were not expected to write a positive review – all views are our own and we retain full editorial control. What a funny name for a hotel: 1 Pery Square. I came across a restaurant in Budapest which is also named after its own address. This looks like a very nice and comfortable hotel, with a lot of personality. I like the design of the bathrooms and the tasty looking breakfast. Interesting to hear that Che Guevara visited Limerick. Thanks for your comments. 1 Pery Square was so comfortable and had such interesting architecture. It is an interesting town to visit. I love checking out spas all around the world. They’re all so very different and yet have that same sense of relaxation (well, most of them). No 1 Pery Square Limerick looks like a perfect place to stay, enjoy a good meal, and have an amazing massage. Bummer that you weren’t able to indulge this time…maybe next trip? And the Frank McCourt Museum would definitely be a highlight for me to check out! Thanks for your comments. Our plan is to return one day and enjoy a spa treatment or two. This sounds like a lovely place to stay! We love Ireland, so I will keep this in mind. 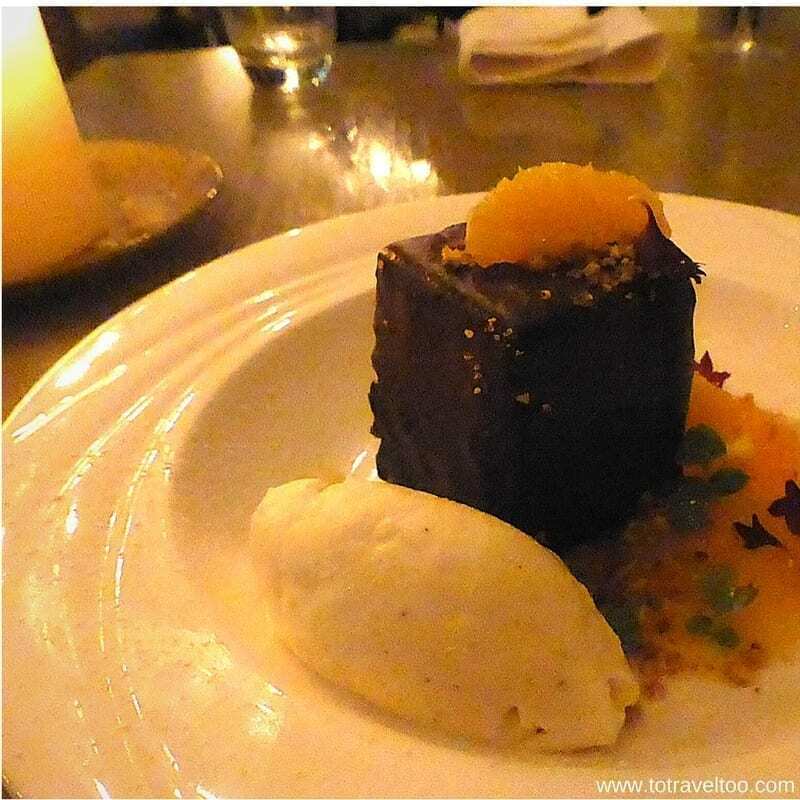 The dinner you ate at Sash restaurant looks delicious- I think I would have to order the exact same items off the menu. Thanks for this recommendation! Thanks for your comments. 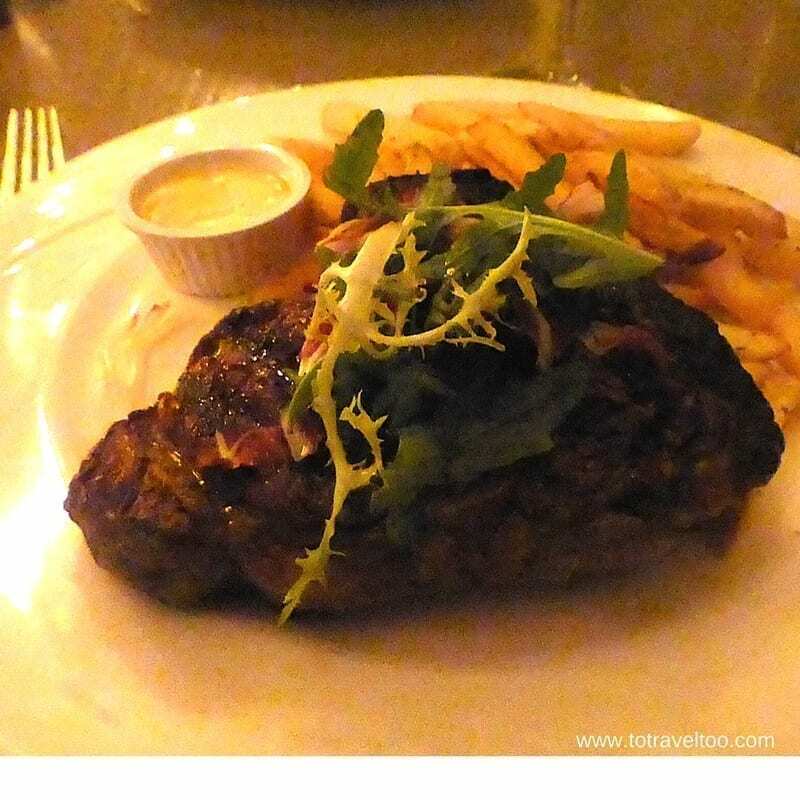 If you do visit Limerick we hope that you can stay at 1 Pery Square and enjoy the meals at Sash. I love the look of this hotel and spa in Limerick. It’s also so satisfying when they have products that are local too. The Voya body scrub sounds awesome and is something I’d book in a flash. Your meal in the restaurant looked delicious too, and you can see the quality of the produce. I’ll keep this place in mind should I ever visit. Thanks for your comments. We hope you can visit Limerick one day and stay at 1 Pery Square – you won’t be disappointed. 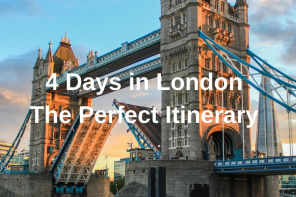 Allow a few days for sightseeing. So, I knew nothing about Limmerick, but just the name of the city has always had me wanting to visit because I imagine it full of literary goodness. Had no idea about the “stab city” name – but I’d still definitely go! 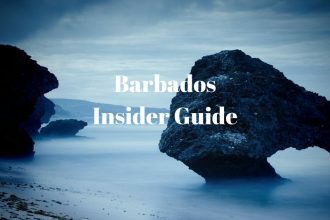 I’m a foodie so of course I zoned in on that portion of the post pretty closely – the descriptions of the food and the photos are more than enough to entice me into visiting! I will definitely be staying where you did as well whenever I get the chance to visit, it looks perfect! Thanks for your comments. 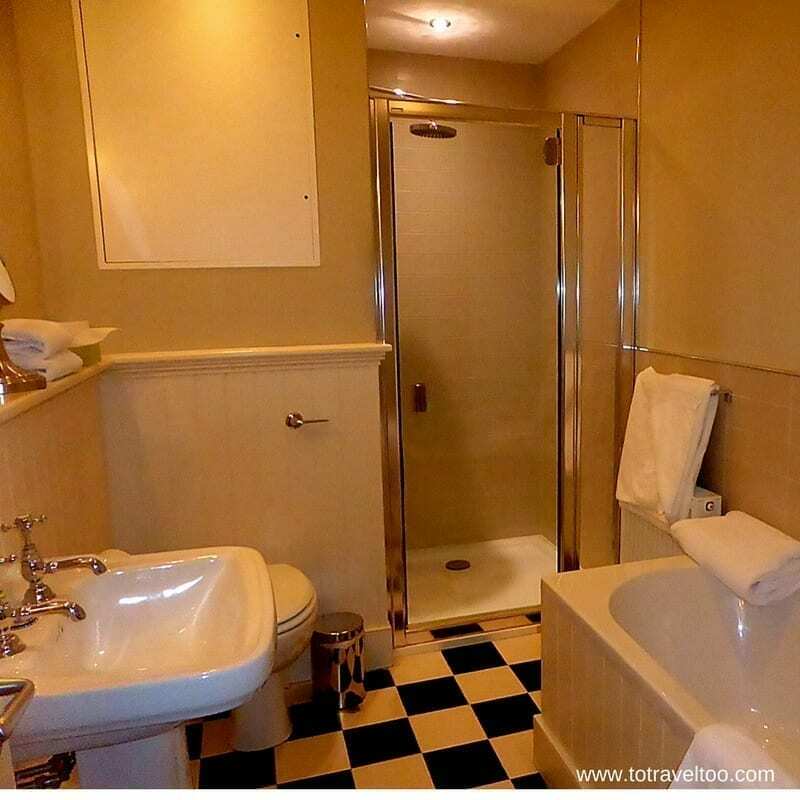 1 Pery Square is a delightful place to stay in Limerick. 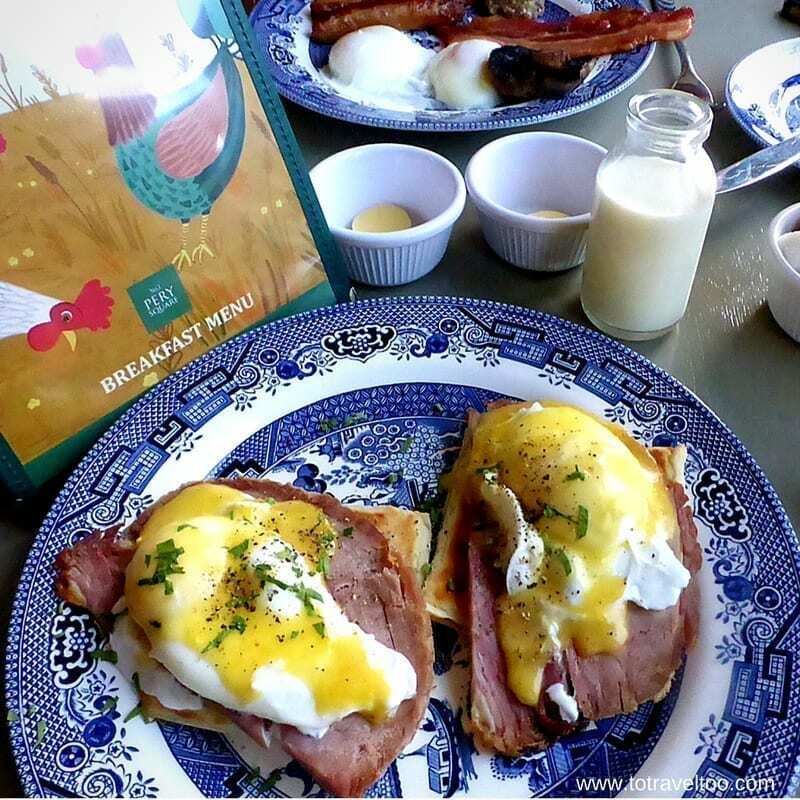 You have to book in for dinner and then enjoy the scrumptious breakfast the next morning. After that enjoy a spa and then a walk around town. You will love it. From the look of the bed at Russell Room, it looks like you had a good sleep on it after a day of enjoying the city. The tea and scones look tasty, too! Other things I like about this accommodation with a funny name is its location; close to museums, pubs, and castles. Thanks for your comments. 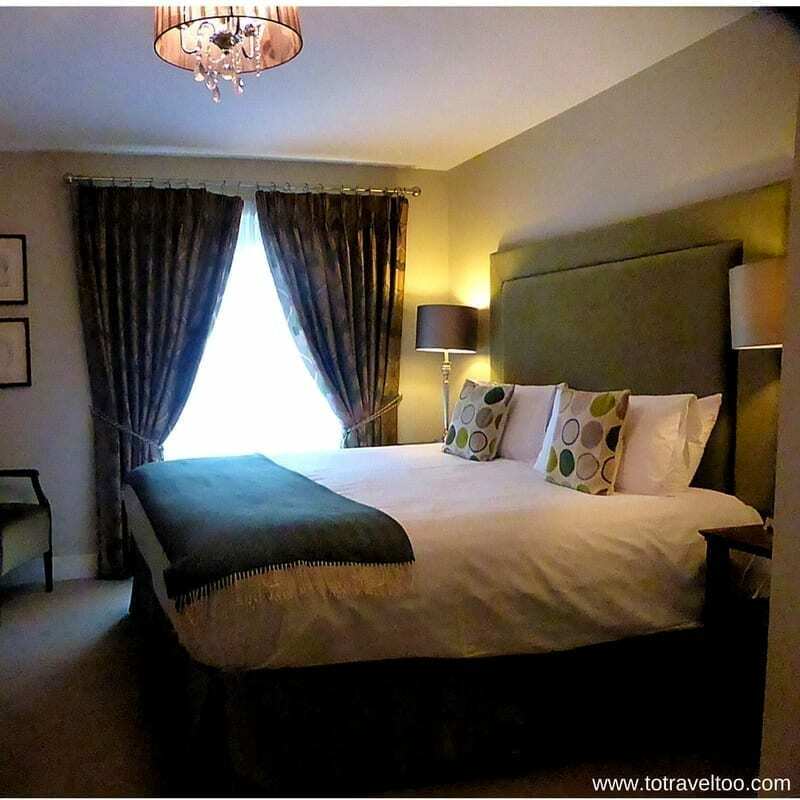 1 Pery Square was so central and Limerick is such an easy city to walk around – a perfect stay. What a lovely place to stay in Ireland. I will definitely keep this in mind for the future. The room looked very comfortable and the meals looked delicious! 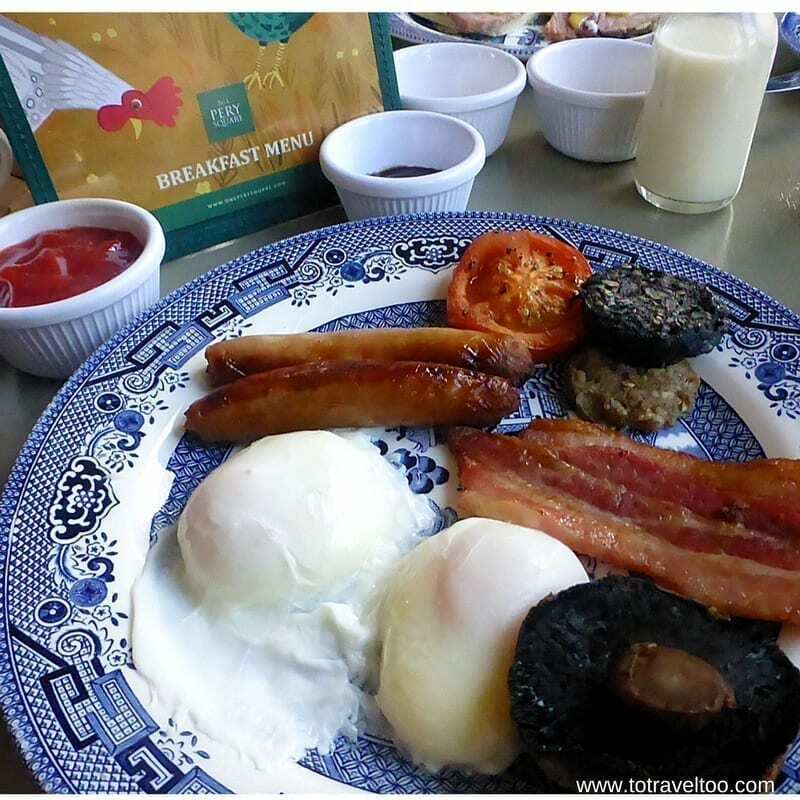 My husband would love those scallops and I would love the opportunity to try a traditional Irish breakfast. Thanks for the recommendation! Thanks for your comments. It was a wonderful place to stay in Limerick and we can highly recommend it. Frank McCourt’s memoir. I would love to experience Limerick through his eyes and I would find his life story so compelling. 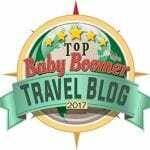 I think the 1 Pery Square hotel and spa is a great base camp for those adventures. Thanks for your comments. No 1 Pery Square is definitely well located for visiting Limerick and the local pubs.